By 1863, emigrant wagons and other kinds of vehicles to Oregon were following Goodale’s wagon route to the Emmett area river crossing, down the Payette, and then north and west to cross at the Olds Ferry near Farewell Bend. Of course that legitimized the Goodale’s Cutoff for that distance as part of the Oregon Trail system. 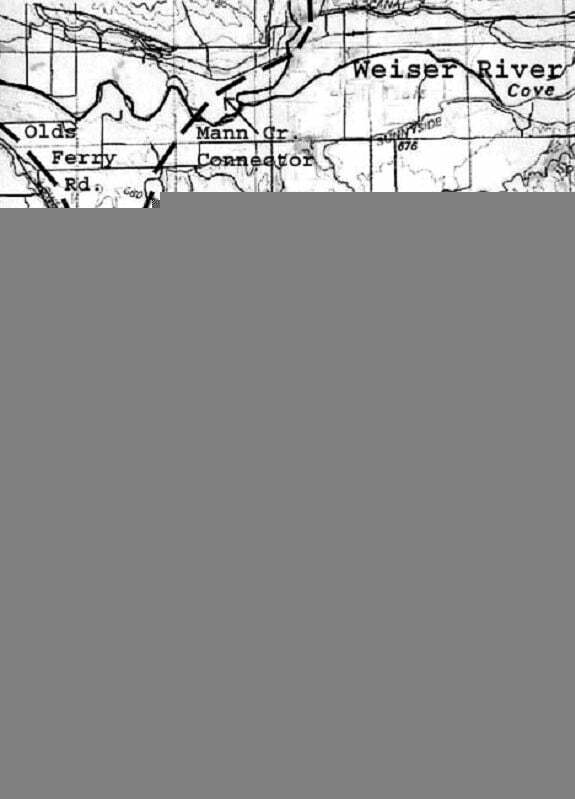 By the middle 1860s this same route from Boise all the way to Olds Ferry had been named “Umatilla Road.” Hawley wrote that the “Umatilla stage line crossed the river” near Emmettsville, 1)James H. Hawley, Ed, “Emmett,” History of Idaho the Gem, Vol. 1 (Chicago, S. J. Clarke Pub. Co., 1920), Chap. 35, p. 729. From Ancestry.com, June 7, 2005. The 1863 stages followed Goodale, until the south-side Payette River trail was opened! According to the plats of 1867 only, two possible routes of the Goodale Train in following the Payette River west from Freezeout Hill were possible. Neither the account of Moses Splawn nor Dunham Wright, both with Goodale, clarified where the river had been crossed. 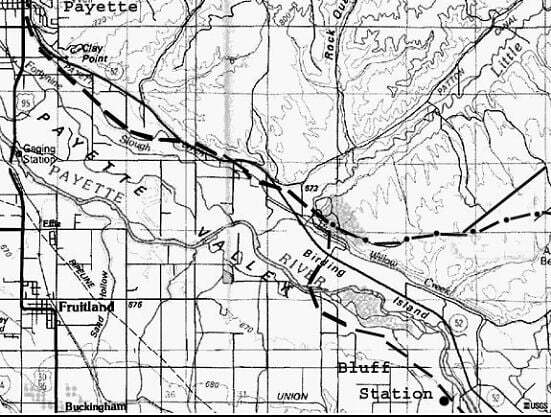 On the map that Irving Merrill and Merle Wells added to their Overland Journal paper in Spring 1996, they had plotted Goodale’s crossing of the Payette River 20 miles west, NW of the later Bluff Station. But this was a main later crossing, located in T8N, R4W, Sec. 20. Nellie Ireton Mills did contend that part of the Goodale Train crossed “the river at Bluff Station,” (see “Auburn-bound party,” Addendum One, page 57, paragraph 3, and Endnote 52) and also wrote that Hunt’s Ferry was built there. 2)Merrill and Wells, p. 10; Mills, p. 57. Mills information was that part of Goodale’s group had gone on down the Boise River, almost to the Fort Boise site, before traveling an old trail north to the Payette River. These wagons crossed near later Bluff Station and rejoined the other Goodale wagons that had come west from Freezeout Hill and along the Payette River. This now seems quite possible from the information presented in Addendum One below. Mills did confuse the Payette River with the Weiser River in her information about the Goodale miner’s wagons that left the Goodale Train to try to go to Florence. She indicated that Tim Goodale did cross the river near Emmett, but incorrectly that he went north with three miners’ wagons on the later Crane Creek route! Dunham Wright wrote that those wagons had instead left the train where John Brownlee came into the camp (north of Little Weiser River), and from there eight men “started with three wagons for what is called Seven Devils Mountains.” 3)Geneva Gibbs Barry Jewell, “Indian Valley and Surrounding Hills” (1990). p. 6. Only 4 pages of a typed copy, unpublished paper, obtained by mail from Gary Frankin, Cambridge, January 20, 2003. He did not indicate that Goodale went with those miners. Other evidence indicates that Goodale went as far as the Snake River, to Brownlee’s Ferry, with the main train before he left them and went on to Oregon. The northern trail indicated on the 1867 plat, crossed the Payette River near Emmett and went NW some distance from the river for several miles before turning and starting NE, up Sand Hollow (T7N, R4W, Sec. 14). The route left the Sand Hollow valley 1 mile NE, went NW along above the bluffs for 7 miles before crossing Big Willow Creek, 4 miles upstream from the Payette River. From there it went back toward the river to the mouth of Little Willow. The south-side trail later crossed the river and joined the north-side route there. (Maps, pp. 28 & 30.) This northern river route has now been established as the Goodale Trail route. There was, somewhat earlier than 1867, a continuous trail following the south side of the River. The descriptions of several emigrant diary writers during and after 1864, which went to and crossed into Oregon at the Olds Ferry, did indicate the fording of the Payette River 20 miles down stream from Freezeout Hill. They did not follow the Goodale Train down the north sides of the river. Elizabeth Porter wrote in 1864: “Tuesday [Sept.] 6. Climb to Paitte [sic] river today. Came down a big hill. Road pretty good. Grass at the bluffs. Wednesday-7. Came 20 miles down river to the ford.” Mary Black wrote in 1865: “1st Sept We have come down a very steep hill [over Camel Back, Goodale’s ridge] . . . We are traveling down Paitt [sic] River. Nooned on a branch . . . 2nd [Sept.] This morning is cold and drizzling rain. We made a poor nooning, came on to the Paitt and crossed it. 4)Elizabeth Lee Porter, “Iowa to Oregon, 1864,” Covered wagon Women, Vol. IX (Spokane, Arthur Clark Co., 1990), p. 29; Mary Louisa Black, “The Unabridged Diary of Mary Louisa Black,” The Oregon and Overland Trail Diary of Mary Louisa Black in 1865 (Medford, OR: Webb Research Group, 2001), p. 52. That would have also been near the western end of the Payette River because of the total travel time, probably the same as Porter’s crossing. We know that the road to the north from Emmett, the packers’ trail begun in 1862 and with wagon traffic possible in 1863, according to W. P. Horton’s second report-one branch going to the Boise Basin-did ford the Payette River near Emmett. The account of Harriet Loughary in 1864, demonstrated that some emigrants going on to Oregon did also cross the river there and then went westward on the Goodale route above the river. That train surely followed the route described above from the south end of Sand Hollow. This was the route described in first part of the Horton road report 5)W. P. Horton, “Placerville, Boise Mines,” Washington Statesman (no city) April 4, 1863, p. 3, c. 2. Typed copy obtained from Gary Franklin, Cambridge, January 20, 2003, pp. 1-2 ; W. W. Lloyd and Mrs. Edna A. Melhorn, “Baker County Historical Society,” Oregon Historical Quarterly, V. 49 (1948). p. 306; Hiram T. French, “Discovery of Gold,” Chapter 5, History of Idaho (Chicago: Lewis Pub. Co., 1914), p. 35; Ibid, “Boise County,” p. 133. French quoted the story told by Moses Splawn, before recorded in John Hailey’s History of Idaho. with the mileages included. He traveled easterly from the Olds Ferry a total of 59 miles and crossed the Payette River, near Emmett, 16 miles west of Horseshoe Bend. On July 31, 1864, Loughary wrote that her train “at night reach[ed] Payette river.” The next day she wrote, “After fording the river we travel down it all day,” and on August 2, “Still going down Payette River.” 6)Harriet A. Loughary, “Travels and Incidents,” Covered Wagon Women, Vol. VIII, p. 153. (The time involved in Loughary’s travel seemed to make this north route slower-2 ½ days-than that of the two later diary writers above!) A ferry had been built to cross the Payette River near the Emmett site as early as 1863, but some travelers chose not to pay the fee and instead forded the river nearby. The train the Loughary family was with had chosen to follow the north side from the Emmett area crossing. Importantly, they reached the Snake River sometime on August 3, and the train nooned on that river. She wrote that they were by then on a stage line road. They had met the newer southern route at the mouth of Little Willow. Umatilla stage road had by then been changed to the south side of the Payette River, and crossed it just west of Bluff Station. This was about 8 miles SE from the western mouth of the river into the Snake. Loughary’s verification of this being the stage road gives evidence that this part of the Goodale Cutoff along the Snake River became Umatilla Road. The stages crossed into Idaho at the Olds Ferry on the Snake River, crossed the Payette near Bluff Station, and headed toward Boise or Boise Basin. The early travelers had forded the river 2 miles to the NW, but one early map (circa 1864) indicated the Hunt Ferry was soon built nearer to Bluff Station 7)James I. Mills, “Lower Payette Valley, 1863-1885,” Map (April 1, 1963), traced from an era map by Mills; Jones, Telephone conversation with James McGill, November 4, 2004. (See map). Neither Porter’s nor Black’s wagons (last page), in 1864 and 1865, crossed on a ferry. The same early map also showed the trail from there along the south side of the river to the crossing. This ford would have been 20 miles down-stream from where the Boise road met the river. Later Falk’s Store was built on the south side of the Payette River, 10.5 miles west of Emmett, and David Bivins built a ferry there. 8)Surf the Snake, p. 1. Obtained by James McGill, Nov. 12, 2004; Boone, p. 132. Some of the traffic from Emmett then went further down river on a newer road on the north side of the Payette, crossed on that ferry, and drove on westerly along the south side of the river. S. B. Eakin did not specify when his train had reached the Payette River, but he wrote: “July 31, , Left at our usual time [7 a.m.]. Crossed the Payette River half after 10 o’clock. . . .Came to the Snake River again in afternoon. Camped on it.” 9)Stewart Bates Eakin Jr., “A Short Sketch of a Trip Across the Plains,” p. 21. Typescript, ISHS Library, Obtained by Jim McGill in Summer 2000. The Snake River would have been approached by the trail about 3-4 miles north of the Payette River, and this would have been about 9 miles from the Bluff Station crossing in T8N, R5W, Sec. 20. (That crossing was also about 1.5 miles south of the later site of Fort Wilson along the Cutoff, now Highway 52). Eakin crossed near the old Bluff Station Crossing in 1866, but he also said nothing about using a ferry. Eakin’s travel time to the Snake River, from 10:30 A.M. until afternoon, seems to indicate the distance that one would travel after crossing the Payette. So Eakin would also have come the day before on the south side of the Payette, to the Bluff Station crossing from Freezeout Hill. Many of the earliest diaries/journals seem to indicate that trains followed the river down the south side west for the 20 miles before crossing, not following the pattern of the Goodale Train. That crossing within a few miles of the lower end of the Payette River was at a wide and shallow part of the river. Travelers who wanted to follow the north side of the River westerly, like Loughary in 1864, and those who also followed the Crane Creek route north would have forded the river near Emmett. 10)Surf the Snake, p. 1. Obtained by James McGill, Nov. 12, 2004; Boone, p. 132. In 1863, Nathaniel Martin and Jonathan Smith built the first ferry across the Payette River at Martinsville, later named Emmettsville and then Emmett, but many emigrants continued to ford! The early meager evidence seemed to indicate the placement of this section of the original Goodale Cutoff route along the south side of the Payette River, following along most of its length. Updated researched information has now changed this. The north route has become the almost sure Goodale train route. 11)Addendum Two, the information update of 01-09-05, added below the Endnotes, supports this change about the probable original Goodale Train route. The old plats by 1867 allow both trails to have existed. Evidence about the route on the north side suggests its diminished use, at least after the first few years. The south side trail was then used more after 1865, to reach the Olds Ferry. 1. ↑ James H. Hawley, Ed, “Emmett,” History of Idaho the Gem, Vol. 1 (Chicago, S. J. Clarke Pub. Co., 1920), Chap. 35, p. 729. From Ancestry.com, June 7, 2005. 2. ↑ Merrill and Wells, p. 10; Mills, p. 57. Mills information was that part of Goodale’s group had gone on down the Boise River, almost to the Fort Boise site, before traveling an old trail north to the Payette River. These wagons crossed near later Bluff Station and rejoined the other Goodale wagons that had come west from Freezeout Hill and along the Payette River. This now seems quite possible from the information presented in Addendum One below. 3. ↑ Geneva Gibbs Barry Jewell, “Indian Valley and Surrounding Hills” (1990). p. 6. Only 4 pages of a typed copy, unpublished paper, obtained by mail from Gary Frankin, Cambridge, January 20, 2003. 4. ↑ Elizabeth Lee Porter, “Iowa to Oregon, 1864,” Covered wagon Women, Vol. IX (Spokane, Arthur Clark Co., 1990), p. 29; Mary Louisa Black, “The Unabridged Diary of Mary Louisa Black,” The Oregon and Overland Trail Diary of Mary Louisa Black in 1865 (Medford, OR: Webb Research Group, 2001), p. 52. 5. ↑ W. P. Horton, “Placerville, Boise Mines,” Washington Statesman (no city) April 4, 1863, p. 3, c. 2. Typed copy obtained from Gary Franklin, Cambridge, January 20, 2003, pp. 1-2 ; W. W. Lloyd and Mrs. Edna A. Melhorn, “Baker County Historical Society,” Oregon Historical Quarterly, V. 49 (1948). p. 306; Hiram T. French, “Discovery of Gold,” Chapter 5, History of Idaho (Chicago: Lewis Pub. Co., 1914), p. 35; Ibid, “Boise County,” p. 133. French quoted the story told by Moses Splawn, before recorded in John Hailey’s History of Idaho. 6. ↑ Harriet A. Loughary, “Travels and Incidents,” Covered Wagon Women, Vol. VIII, p. 153. 7. ↑ James I. Mills, “Lower Payette Valley, 1863-1885,” Map (April 1, 1963), traced from an era map by Mills; Jones, Telephone conversation with James McGill, November 4, 2004. 8, 10. ↑ Surf the Snake, p. 1. Obtained by James McGill, Nov. 12, 2004; Boone, p. 132. 9. ↑ Stewart Bates Eakin Jr., “A Short Sketch of a Trip Across the Plains,” p. 21. Typescript, ISHS Library, Obtained by Jim McGill in Summer 2000. 11. ↑ Addendum Two, the information update of 01-09-05, added below the Endnotes, supports this change about the probable original Goodale Train route.